After a steep decline starting in the 1980s, manufacturers have added back more than a million jobs over the course of the economic recovery, and further revitalization has become a bipartisan priority with growing momentum. A critical component of future growth, popularized by Harvard Business professors Gary Pisano and Willy Shih and written about by The Century Foundation, is to grow the “industrial commons.” The commons is a way to unify regional actors around their shared goals: increase research and development; improve skills and training opportunities; and strengthen connections between suppliers. No single company alone can provide these critical shared resources, and so the industrial commons fosters collaboration in order to increase access to them for everyone. Manufacturing Employment, US, 1979–2018. Notes: All manufacturing employment in thousands, seasonally adjusted, 1979—2018. A pilot program launched in 2014 by the Commerce Department proved to be a promising approach to putting this idea into action. The Investing in Manufacturing Communities Partnership (IMCP), administered by the Economic Development Administration, aimed to strengthen the U.S. manufacturing sector and bolster regional economies. IMCP encouraged coordination among public and private actors and rewarded coalitions that provided actionable strategic plans for their region with a special designation. Through a competitive process, communities would be designated a “manufacturing community” (MC), based on their capacity to create well-paid jobs, spur innovation, and improve workforce development in the manufacturing sector. The program officially designated twenty-four regions as “manufacturing communities.” Twelve communities were designated in 2014 and another twelve in 2015, with each designation lasting two years. Each community consisted of a mix of local governments, public private partnerships, regional planning agencies, workforce training agencies, and higher education. Federal assistance was provided to each group to help realize strategic goals, and to access existing funding opportunities. Worker training and placement: Many companies report difficulty finding skilled workers. Coordinated efforts improve training pathways for boosting skills in the workforce, and provide a matching mechanism for worker placement. Industry innovation and competitiveness: Single-company tax-based incentives, or so-called “smokestack chasing,” pit states against each other and privilege the attraction of new companies over the retention and growth of existing companies. Sector-based strategies are a good low-cost alternative that spur innovation and competitive industries. Connecting smaller businesses with resources: Coordinating regional supply chains provides access to capital for small- and medium-sized businesses, which historically have been an engine for economic growth in America. The benefits that IMCP offers have not been extended by the Trump administration. However, there is a bipartisan bill currently under negotiation that would re-authorize IMCP and designate even more manufacturing communities. Senator Kirsten Gillibrand has introduced the bill and has bipartisan support from Senators Jerry Moran (R-KS), Shelley Moore Capito (R-WV), and Susan Collins (R-ME), along with four others1. A bipartisan House version was introduced by Representative David Cicilline (D-RI), and has been cosponsored by Tom Reed (R-NY), Tim Ryan (D-OH), and Claudia Tenney (R-NY), among others. IMCP Designations by Area, Sector, and Year Designated. Source: Economic Development Agency. How did communities get designated? Community proposals centered on key industries to be strengthened, described a vision for achieving goals for their region’s competitive manufacturing sectors, and included a list of key partners. As shown in Figure 2, Pittsburgh and Chicago specialize in metals manufacturing; south Kansas, central Washington, southern California, and Connecticut specialize in aerospace; Memphis and Minneapolis in medical devices; Tennessee Valley and Detroit in auto manufacturing; and so on. Each community would work toward unique goals, which were determined by the communities in the application. For example, Pittsburgh’s vision was to integrate new technologies into existing production, whereas Peoria’s was more based on building resilient supply chains. Chicago had a big focus on workforce development partnerships, and central Washington State aimed to grow the innovation pipeline. What Did Communities Gain from the Designation? Each MC was provided a federal point of contact (POC) from one of the participating agencies. POCs helped their MC identify and access existing federal economic development funding. Communities especially valued this personal assistance in navigating bureaucracy and the various funding channels, so much so that some leaders designated their point of contact as their Best Friend Forever, or BFF3. Designated communities were also given preferential consideration by some of the eleven participating agencies for grant funding and technical assistance, depending on the grant program, and at the discretion of the agency. Major federal IMCP adopters included the Environmental Protection Agency (EPA), the Department of Defense (DOD), and the Department of Labor (DOL), among others. The EPA has shown particular interest in supporting sustainable manufacturing development, especially in helping communities with the remediation and redevelopment of brownfield sites. The DOD has supported manufacturing communities not only for procurement but to help sustain businesses and communities impacted by the 2014 military downsizing, for example in the central Washington MC. The DOL has supported communities by spearheading a movement toward practical education by, in particular, funding training centers for advanced manufacturing, for example, in southern California’s MC. The EDA is the nation’s leading economic development agency and has utilized its own tools to bolster the communities it had designated. Small investments have had a high payoff. According to EDA’s 2015 Annual Report, less than $800,000 invested in a south Arkansas training center is projected to create and retain over 500 jobs, and to stimulate a 15-percent increase in advanced manufacturing jobs over the next five years. The EDA has also done some heavier lifting and helped spur additional private funding. A $3-million investment in a short-line railroad extension for more efficient transport of Illinois’ manufactured goods could create over 1,000 new jobs and over $300 million in private investment. MCs were featured in SelectUSA investment summits organized by the U.S. Department of Commerce as a way to attract foreign direct investment. The summits provided a space for their strengths to be recognized on an international scale. According to program analysts, this exposure boosted job growth and amount of capital raised. Source: SelectUSA, summit impact by state. A key goal of the program was to spur enhanced strategic coordination, and interviews with community representatives confirmed that the program was successful on this count. In a group interview of MC leaders with The Century Foundation4, sentiments toward the designation were resoundingly positive, even among those communities that did not see a boost in grant funding. Almost all MC representatives noted the benefits of focus and coordination among groups that were previously only loosely connected. Coordination boosted capacity for higher-impact investment, regional cohesion, and workforce development. A representative from the Alamo/San Antonio community said the designation encouraged them to look outside of their own metropolitan statistical area to loop in parts of the supply chain that were previously considered on the margins or out of the way, and that it has helped their surrounding communities significantly. A bipartisan group of senators are working to continue the progress made by the IMCP pilot program. The bipartisan bill, the Made in America Manufacturing Communities Act of 2017, would revitalize the manufacturing community designations. Many details in process and intention are the same as the original IMCP program. Communities will again be selected for a two-year designation by competitive process based on capacity for strategic plan creation and realization. All federal agencies will again be invited to participate in offering technical and grant assistance. Previously designated communities would be re-designated for up to three two-year terms (six additional years). All previously designated communities would need to submit their track record on key metrics. Preferences for community selection would include those that incorporate workforce strategies focusing on the inclusion of women and minorities, who are under-represented in manufacturing jobs. Limited additional cost to the federal government: only $5 million over five years for program administration. Technical assistance from the federal government to identify appropriate federal government sources that would boost competitive, high-paying manufacturing clusters. Increased collaboration between the private sector and government, academic institutions, and other stakeholders through the required strategic planning process. One argument against the bill is that it leaves non-designated communities behind, while helping others to get ahead. Another perspective is that IMCP makes the most of limited federal economic development dollars by incentivizing communities to come together to create a strategic plan before they get federal grants. The benefits of this type of project are telling, even for communities that applied but failed to get designated in previous rounds. According to former EPA official Matt Bogoshian in an interview with The Century Foundation, IMCP coordinators received thank-you letters from communities that did not get designated expressing appreciation for the substantive connections gained through the process of applying. Moreover, this approach recognizes the unique contributions of manufacturing to the U.S. economy. Manufacturing adds disproportionately to GDP and has much higher multiplier value throughout the economy, and represents a disproportionate share of innovation investment. However, manufacturing faces distinct international competition and the best way for the United States to maintain its global competitiveness is to focus on clusters of strong subsectors. The IMCP program would allow stakeholders in those competitive clustered sectors to maintain their edge. 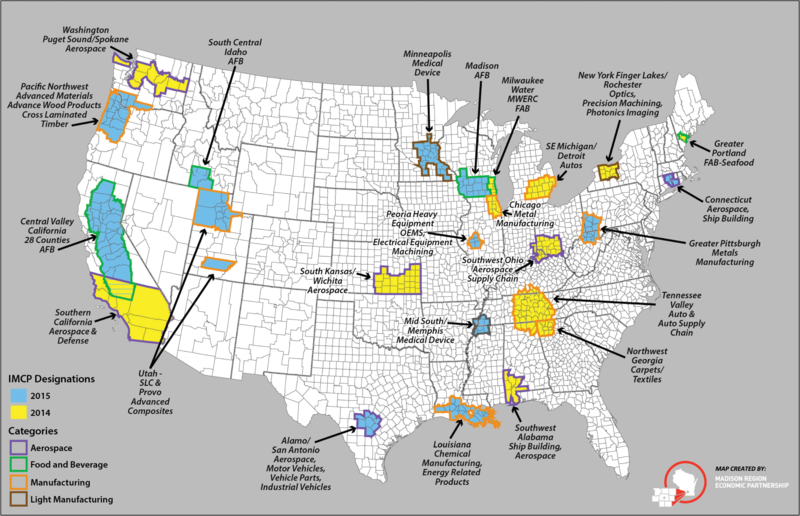 Not surprisingly, many of these communities are in parts of the country that have been economically disadvantaged by global trade deals, and IMCP is one way that the federal government can help those communities catch up. The bill passed the U.S. Senate Commerce, Science, and Transportation Committee and is awaiting further action. IMCP was a great example of how a small federal investment can lead to big results in creating the distinct public–private cooperation needed to revitalize U.S. manufacturing. It’s not surprising that leaders from both sides of the political aisle are working to continue the effort. Senators Richard Blumenthal (D-CT), Angus King (I-ME), Amy Klobuchar (Democrat-affiliated, MN), and Tammy Baldwin (D-WI). The Appalachian Regional Commission (ARC); Delta Regional Authority (DRA); Department of Housing and Urban Development (HUD); Department of Labor (DOL); Department of Transportation (DOT); Environmental Protection Agency (EPA); National Science Foundation (NSF); Small Business Administration (SBA); U.S. Department of Agriculture; U.S. Department of Commerce (DOC); and the National Institute for Standards and Technology (NIST). The initial request for proposals was issued in 2014. Related by these community leaders to the author in a group interview, March, 2018. Interview conducted by the author with manufacturing community leaders by phone, March, 2018.